In 2004, the United States had a limited number of Buffaloes in service, with an order for 15 more, at a cost of $10 million. On June 6, 2008 Force Protection, Inc delivered its 200th Buffalo to the U.S. Military. Interestingly, since these vehicles are so specialized, like other Mine Protected Vehicles, those vehicles not left in country, are either put in storage or farmed out other organizations and will not be replaced in the inventory when they reach the end of their operational life or upgraded. At a mere $670,000 each, they are, of course, throw away assets. This is the second kit of this vehicle that I have seen. The purpose of it is to dig up and deactivate roadside bombs and mines. It is not a small vehicle and is larger in length than may tank kits (minus the barrel, of course). The main difference between this kit and the previous one is that it has the slat armor all around it. This slat armor is molded in injected plastic. This is, of course, not really armor in the main sense of things, but works in much the same was as 'Schurzen' on German tanks and is designed to allow RPGs to detonate against the screen and therefore use up its force relatively harmlessly. Molded in the usual tan plastic that Bronco likes to use, the kit is up to their renown standards when it comes to detail. The options are the ability to model the scoop extended or retracted against the side of the vehicle, and to install the remotely operated machine gun and sensors, which would fit on the pedestal on the forward upper hull. 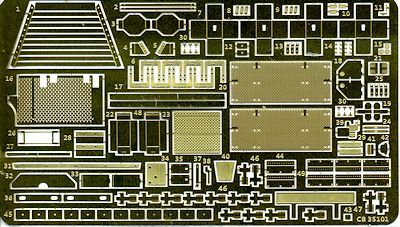 There is a nicely done photo etch fret for screens, a few equipment boxes and a myriad of smaller bits and pieces that are the norm with modern armor kits. Also included are two sizes of plastic tubing in .4 and .6 mm sizes. These are used to represent what I guess are hydraulic lines. The kit provides a very detailed suspension and drive line as much of this is exposed. I found it interesting that each wheel/tire is built up of separate bits with the tread being a separate item as well. The kit has a full interior with driver's position and various crew seats. No engine is provided, so this is technically a curbside. The upper bodywork is well done with properly thick 'glass' windows that should allow you to see your interior work unless you tint them. With a vehicle like this, there is a ton of external detail as most equipment is kept outside. The inside, due to the vee shape, is rather limited as to what can be carried, though a full radio suite is provided. One of the highlights of the kit is the large crane scoop that is used to dig under mines at a distance that does not put the crew in danger. As mentioned, this can be built extended or retracted against the side. Bronco's instructions are contained in a 36 page color book. Each of the 57 construction steps is well drawn and has detail drawings to help out. In some areas the builder will need to stretch some sprue. 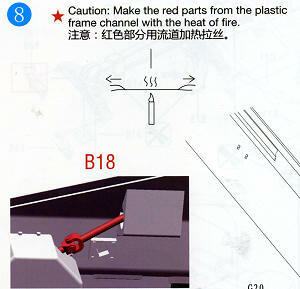 One note caught my attention and I have scanned that section from the instructions. Not many folks that I know can scratch build a universal joint out of sprue. 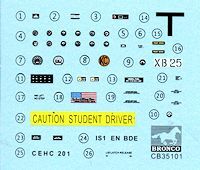 The decal sheet is very nicely done and provides markings for a single vehicle of an unknown unit. The vehicle is in a desert tan and one is supposed to paint the clear bits with a clear blue to duplicate the very thick armor plated glass that is used on these huge vehicles. The small decal sheet is nicely done and includes all the instrument panel dials as part of the suite. 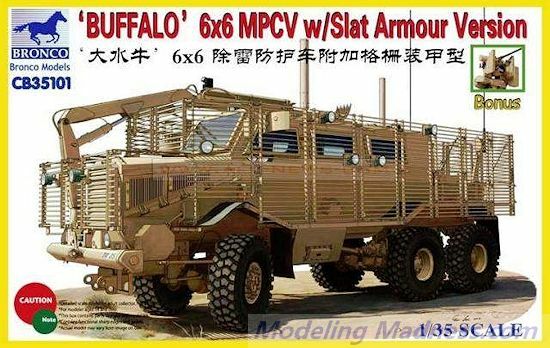 This is very much a cool kit for those who like to build modern military vehicles. It will not be a quick build, thanks to all the parts that are included, but I can guarantee that it will stand out in any collection. Thanks to www.dragonmodelsusa.com for the preview kit. This one should be at your local shop or have them order it for you.